Influencer marketing is when a business collaborates with an influential person on social media to promote a product, service, or campaign. These people, know as “social media influencers,” have dedicated and engaged followings. Celebrity endorsements were the original form of influencer marketing. But in today’s digital world, regular content creators with niche audiences can often offer more value to brands. 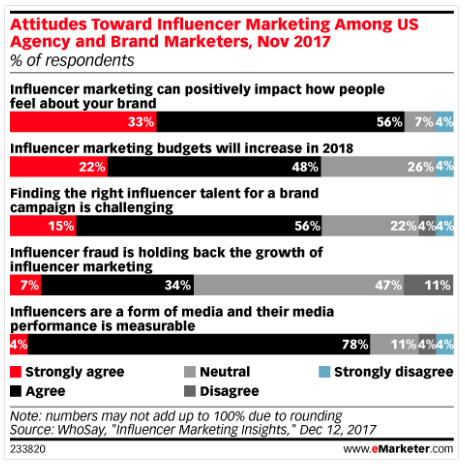 As reported by eMarketer, a survey from WhoSay found that 70 percent of U.S. agency and brand marketers agreed that influencer marketing budgets would increase in 2018. And 89 percent said influencer marketing can positively impact how people feel about a brand. Not convinced influencer marketing can lead to real business results? A survey by Dana Rebecca Designsfound that 72 percent of respondents had made a fashion, beauty, or style purchase after seeing something on Instagram. Instagram is overwhelmingly the platform of choice for social influencers. 78 percent identify the photo-sharing site as their top platform for collaborating with brands. Sponsored Instagram posts generated a billion likes in 2017. Quite simply, an influencer is someone who carries influence over others. A social media influencer is someone who wields that influence through social media. The form of influence can vary and no two influencers are the same. The right influencer is someone who can reach your target audience, build trust, and drive engagement. They will create original, engaging content that is in line with their own brand (rather than following a template advertising style provided by a brand). For this reason, it’s critical to work only with social media influencers whose creative vision aligns with your own. Relevance: The influencer is sharing content and has an audience relevant to your business and industry. Reach: The number of people you could potentially reach through the influencer’s follower base will bring value to your business. Resonance: The potential level of engagement the influencer can create with an audience that’s relevant to your brand.Bigger isn’t always better. A huge follower count is meaningless if those followers aren’t interested in your business’ offerings. 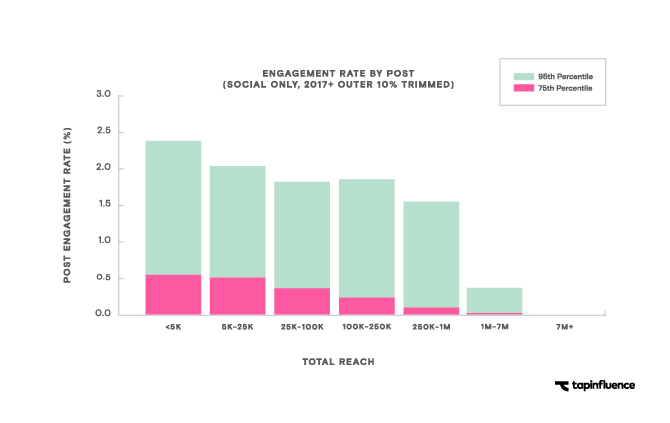 And a smaller follower count can be very powerful if it’s a niche area and the potential influencer has a dedicated and engaged following.Tapinfluence found that engagement rates are often higher for “micro-influencers”—those with 5,000 to 25,000 followers. Your influencer campaign can’t be all things to all people. An effective strategy requires you to speak to the right people using the right tools (and, in this case, the right influencers). The first step is to define who your audience will be for this specific campaign. Developing audience personas is a great way to make sure you understand who you’re trying to reach. Once you’ve done that, create a matching set of influencer personas. This will help you understand the qualities you’re looking for in your influencer partners. For marketers, the key is trust. Your audience must trust and respect the opinion of the influencers you partner with. Without the trust component, any results will be superficial and you’ll struggle to see a tangible business impact from your efforts. How do you tell if your potential influencer is trusted? Engagement. That means plenty of views, likes, comments, and shares—all from the precise follower segments you’re trying to reach. A good engagement rate also means a loyal following, rather than an inflated follower count bolstered by bots and fraud accounts. Besides finding a fit for your own niche, you need to find someone who’s producing content with a look and feel that complements your own. And the tone must also be appropriate for the way you want to present your brand to potential customers. This will ensure things don’t feel disjointed in either party’s social media posts. It’s also important to check for shared values. The Body Shop’s Integrated International Brand Communications Director told traackr.com that they don’t work with influencers who wear fur because it’s inconsistent with their mission to end animal testing. Instead, they like to work with vegan influencers as they command the right audience. A social media influencer who has worked hard to build a following will not accept a deal that makes their own personal brand seem inconsistent. And, after all, influencers are content creation experts—you’ll get the best value from their work by allowing them to showcase those skills. Busabout launched a search for four influencers to be the “ultimate travel squad,” touring around Europe and posting on social. While all worked on the same campaign, the content was varied and showed each person’s unique style. It’s a good idea to provide some guidelines about what you’re looking for, of course, but don’t expect to stage-manage the entire campaign. You can also recruit share or cross-post content from influencers on your own channels. This helps highlight the collaboration and provides benefits to both the brand and the influencer. Mom I’m Fine fame, they shared his posts on their own social channels. Kubben Quiñonez has more than 300,000 Instagram followers and got tens of thousands of likes for the posts on his channels. Want to Travel, on the other hand, is just getting started on Instagram, and at the time of the campaign had only a few hundred followers themselves. But when they shared a @momimfine post, they got an impressive 23 percent engagement rate.